How completely adorable are these?? 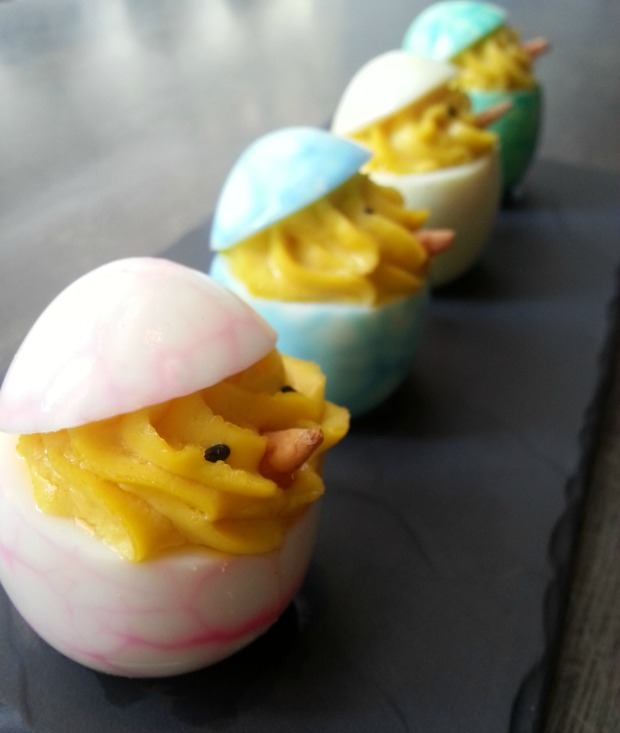 I love a good deviled egg, but never thought to make them upright - or to colour them first, like Chef David Vandenabeele of Langham Place, Fifth Avenue in New York, who has come up with another a great recipe to share. These will have a place of honour on our brunch table this Easter weekend! Thanks David! Steam the eggs in boiling water for 5 minutes. Gently roll them on a hard surface so that little cracks appear in the shell, then boil them in water with food colouring added for another 5 minutes. Cool the eggs in an ice water bath then peel the shells off. Chop the yolk finely and add all the other ingredients, season to taste. Eyes are two black sesame seeds and a small piece of carrot makes a nose.